The West Metro Water Alliance, along Metro Blooms, Blue Thumb and Wild Ones, launched the Pledge to Plant for Pollinators and Clean Water Project in February with the goal to encourage private land owners to install 10,000 wildflower plantings in the next three years to protect pollinators and the health of area waters. In the Twin Cities metropolitan area and other regional population centers, turf grass and other impervious surfaces are concentrated and prevent water infiltration, leading to increased flow on the surface of the land, and much more rapid flow into streams. The Environmental Protection Agency identifies runoff as the leading water quality threat to our urban lakes and streams. In 2015, American beekeepers lost 40% of their colonies. Monarch butterfly populations are struggling and research suggests other pollinators are also suffering serious declines due to loss of habitat and overuse of pesticides. Managed landscapes on public and private properties, including raingardens, stormwater ponds, and shoreline plantings, provide the opportunity for increasing diversity through blooming native patches that connect pollinator corridors while helping to keep water clean by capturing and filtering runoff. The Pledge to Plant education and engagement partnership will encourage new or expanded “pollinator-friendly” native plantings and map existing native plantings to create a baseline of pollinator-friendly stormwater best management practices. By leveraging both the mandates on local governments to educate the public on water quality and the growing public awareness of the plight of pollinators, this project achieves shared goals. New educational resources and exhibits will be developed to foster positive social pressure for converting impervious and turf areas to native pollinator habitats for clean water. Learn more about Pledge to Plant. The City of Plymouth is offering a new rebate program to residential and commercial property owners who complete water efficiency improvement projects. Funded by a grant from the Metropolitan Council, the rebate program was established to encourage water conservation in Plymouth and reduce the demand on the municipal water supply. Rebates will be given for replacing old, inefficient toilets or washing machines and installing irrigation controllers. All property owners who are customers of the municipal water supply are eligible. Property owners interested in replacing existing outdated or inefficient appliances should look for the Energy Star or WaterSense certification from the Environmental Protection Agency on new products. Rebates can reimburse property owners for 75 percent of the cost of the device – up to a maximum of $50 for WaterSense toilets, $100 for Energy Star washing machines and $200 for WaterSense irrigation controls or rain sensors. Rebate funds are limited and will be issued to qualified applicants on a first-come, first-served basis. Rebates will be issued upon completion of work and submission of payment request accompanied by original receipts for expenses. The deadline to submit a rebate application is June 30, 2017. Learn more and apply for a rebate. Brooklyn Center and eight other cities make up the Shingle Creek Watershed and will celebrate Earth Day with the 15th annual Great Shingle Creek Watershed Clean Up. Beginning April 16 through April 22, hundreds of volunteers from Plymouth to the Mississippi River will line the banks of Shingle Creek picking up everything from pop cans to abandoned vehicles. Last year, over 100 volunteers collected 114 bags of debris from banks of the Shingle Creek, as well as parks and roadways. Join us at Brooklyn Center’s new Amphitheater in Centennial Park from 8 a.m. to noon on Saturday, April 16 for an expanded Shingle Creek Clean Up event. Learn about the benefits of rain gardens and check out booths on hand to learn about sustainability and protecting Minnesota’s water resource before heading out to help clean up the banks of Shingle Creek. This year, many of the groups affiliated with Brooklyn Center Adopt-A-Park/Trail/Street Program will clean up their assigned sites during this week. Groups and individuals not already connected with a park, trail, or street will be assigned to an area of Shingle Creek to pick up trash and debris. If you are interested in participating either stop by the event or contact Brooklyn Center Public Works at 763-585-7100. Trash bags and cotton gloves will be provided the day of the event at the Centennial Park Amphitheater at 6301 Shingle Creek Parkway in Brooklyn Center. In December, the chairman of the Elm Creek Watershed Management Commission (ECWMC), Doug Baines of Dayton, and EMWMC Commissioner Elizabeth Weir of Medina, attended a presentation on how local governments can plan for climate change. Barr Engineering hosted the event that featured speaker Michael Simpson from the Center for Climate Preparedness and Community Resilience in New Hampshire. Simpson presented data showing a pattern of increasing severity and frequency of 10-year storm events, which bring prolonged periods of heavy rain. Simpson focused his talk on building adequate infrastructure at the city level to manage these intense rain events and to avoid future flooding. Simpson began by noting how the City of Victoria has built resiliency into its infrastructure by replacing old culverts with larger culverts designed to handle more storm water. Several audience members pointed out that relying on this method upstream would create increasingly larger volumes downstream, leading to unmanageable flooding in downstream communities. Simpson agreed and said that the long-term solution is to design retention of rainfall using various practices including infiltration and holding basins. Simpson ended his presentation with the unsettling prediction that by 2050, it’s likely the current 100-year storm event will occur as frequently as our current 10-year storm event. It’s time to address the issue! 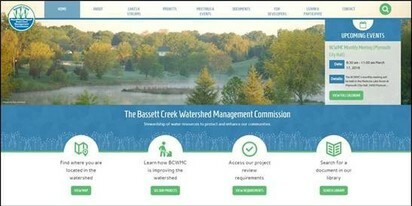 The Bassett Creek Watershed Management Commission recently announced the launch of its new website: www.bassettcreekwmo.org. The new site includes interactive maps to find lakes, streams, and projects, information and water quality graphs for ten lakes and four streams, reports and photos of watershed projects, an events calendar and resources to learn more or find ways to participate. Construction of the Schaper Pond Diversion Project near the intersection of Highways 55 and 100 in Golden Valley was completed in December. Schaper Pond is a DNR public water wetland through which the Sweeney Branch of Bassett Creek flows before emptying into Sweeney Lake. In 2012, the BCWMC completed a feasibility study for improving the pond’s effectiveness at removing phosphorus. The study recommended the construction of a diversion structure within Schaper Pond to direct more of the stormwater from the south of the pond to the larger and deeper northwest lobe of the pond where more treatment could be provided. The feasibility study found that the project could remove an estimated 81 to 156 pounds of phosphorus during the summer months each year which could substantially improve water quality in Sweeney Lake. 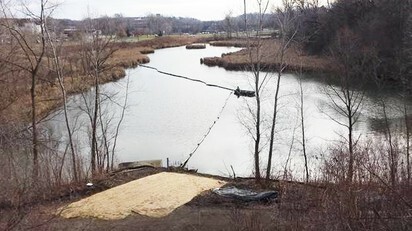 In early December, contractors deployed and secured a vertical baffle in the pond. This project was completed by the BCWMC in cooperation with the City of Golden Valley. Site restoration work at the construction area will occur in spring 2016. For more information on the project, visit www.bassettcreekwmo.org. Great Shingle Creek Clean Up on Saturday, April 16 from 8 a.m. to noon. Sunrise Native Plants sale on Saturday, May 28 from 8 a.m. to 1 p.m. at St. Barnabas Lutheran Church in Plymouth. Gather up home improvement and landscaping ideas for upcoming projects at the Plymouth Home Expo. The event will be held on Friday, April 8 from 6 to 9 p.m. and Saturday, April 9 from 9 a.m. to 1 p.m. at the Plymouth Creek Center Fieldhouse. The event is free to attend. This fast-paced and focused three-hour workshop explores simple changes you can make on your property that helps protect clean water and create healthy habitats. It includes the latest information in healthy yard care practices combined with our popular do-it-yourself approach to rain garden design and installation. Following a presentation, you will have the opportunity to receive assistance from Landscape Designers and Master Gardeners in a small group setting to go over your particular property issues. When: Tuesday, April 19 from 6 to 9 p.m.
Where: St. Barnabas Lutheran Church, 15600 Old Rockford Road in Plymouth. This workshop is free but space is limited, so please RSVP before space runs out! Learn more about rain garden workshops with Metro Blooms. Attend the 2016 Urban Water Forum: Taking Action to Protect Our Lakes and Streams at the Minnesota Landscape Arboretum for presentations and discussions on citizen-based science and the active role you can take in protecting water resources. When: Saturday, April 23 from 8:30 a.m. to 12:30 p.m. Learn more and register. Registration fees are $15 for Arboretum Members and partner organization affiliates and $20 for non-members.